I met up with Chris Ewart in a Bean Around the World on Main and 20th on a particularly rainy Thursday afternoon; the sounds of coffee being ground, heavy rainfall pattering outside and the hum of customers flooded our encounter. It was not the first time we had sat down together at this coffee shop, and I hope it will not be the last either. Chris is a published author and an English professor; he has worked for the Calgary Herald as an arts writer, taught arts writing at the University of Calgary and at the Alberta College of Arts and Design and has also taught in the English department at Simon Fraser University. Currently, Chris is teaching at Farleigh Dickson University’s Vancouver branch. Our meeting was more like a casual encounter than an interview as I had taken a class with him at SFU. Chris was very interested in the class that assigned me this interview. When I mentioned writing in and for the arts, he immediately showed a keen interest in the subject. I asked Chris if this ever comes into play with his own work, besides teaching others how to write for the arts. Chris’ 3 three-year-old son, Hamish, who was completely covered in chocolate banana bread, then interrupted us; we concluded he must be looking for a napkin. It was interesting to watch a man who instructed me a whole semester, through the metaphorical sweat and the not-so metaphorical tears of my creative process, become a ball of mush to his adorable son and just as quickly turn back on to the topic we were discussing. We were further interrupted and amused by Hamish’s antics; he clearly was very interested in what we were doing, as much as a three year old can be. We digressed and found our way back on topic, I asked Chris the most classic of questions for those in the arts, why did he start writing? And why did he take it as far as a PhD? Chris went on to talk about the Advanced Creative Writing class that he had instructed at SFU that I had taken with him. He enjoyed that everyone in the class had a great dynamic of different backgrounds and passions within the craft of creative writing and that we all worked together so well, not to mention that the group was relatively small and thus made good friends with each other quickly. This really brought me back to the reason I wanted to interview Chris in the first place, it was a memorable class and I felt that he and I shared a connection of stumbling upon creative writing as a real option rather than just a hobby. Miss Lamp, a novel by Chris Ewart, 2006. Image courtesy of Coach House Publishing. 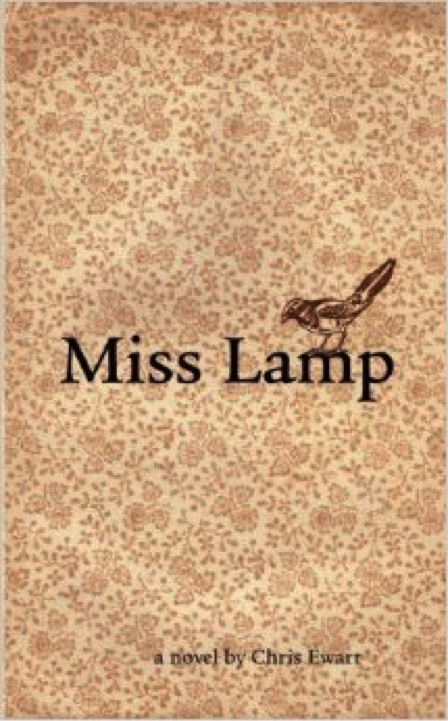 Miss Lamp is Chris’ first and, currently, only novel and he had gifted it to everyone in my class at the end of the semester. And that’s the thing about Chris, he really does care about his students and he wants to support future writers as much as he can. Throughout our meet-up we kept falling back into talking about getting a group together of past students of his and colleagues of mine who just need a space to get together with other writers to work on their practice. As Chris put it, “Vancouver can be a very cold place considering how cultural it is.” On the note of always continuing one’s practice, Chris mentioned that he was intending on publishing his second book right after the first, but several years later is only currently just finishing the last couple dozen pages. I asked him how teaching affected his writing, if his students and their processes inspire him or if it’s more just a hindrance on his time to focus on his own craft. I thought about the fact that Chris had experience in writing for and about the arts, and because it is an area I am personally interested in getting into I asked him how he felt about the industry. We got a little back on topic of Chris’ career, and began to talk about his book, a reading experience that I described to him as feeling as though I was on some sort of drug because of it’s purposeful ambiguity about the setting and characters that left me feeling as though I floated in a haze through it all, only sometimes awoken by jarringly odd moments such as love scene with between a woman and a peach. Peaches, 2015. Image courtesy of The Peachland Museum’s website.